Wisconsin Car Accident Injuries | Hupy and Abraham, S.C. The cause of your car crash and the specific way the cars collided are important, but if you’ve been involved in a car accident then there is something that is more important. Regardless of why you were hurt, you need to make a recovery. Often, before you can get started on your recovery you need to know exactly what you are recovering from. While only a medical doctor can make a diagnosis, it is important to be aware of the following common types of injuries that are suffered in Wisconsin car accidents and to talk to your doctor about any symptoms or concerns that you have. The area of the brain in that was hurt. The force with which the brain was hurt. Exactly how the brain was hurt. Nerve damage, diffuse axonal injuries, and shearing or tearing of white matter: This type of injury occurs when the brain is moved backward and forward as the result of rapid acceleration or deceleration of the car. When the brain is moved in this way the axons, or nerve cells, are disrupted and the white matter of the brain may tear or shear, resulting in a traumatic brain injury. Lacerations: A laceration injury occurs when the tissue or blood vessels of the brain tear. These brain injuries often occur when the force of the crash causes the brain to collide with the bones of the skull. Blood clots or hematomas: A hematoma is a blood clot that forms when a blood vessel ruptures. A brain hematoma may occur between the skull and dura lining of the brain (epidural hematoma), between the brain and the dura lining (subdural hematoma), or within the brain tissue (intracerebral hematoma). Concussions: A concussion may occur when someone hits his head against an object or when the brain hits the skull. While most people recover from concussions, the recovery process can take several weeks or longer. Additionally, severe concussions or people who have previously suffered a concussion may suffer ongoing complications. Brain injuries can be life-changing or life-ending, depending on what happened to you. Anterior cord syndrome: This type of injury occurs when there is damage to the front of the spinal cord. Symptoms of this type of injury include impaired body temperature, touch, and pain sensations below the point on the spinal cord that was injured. Central cord syndrome: This type of injury occurs when there is damage to the center of the spinal cord. Victims experience loss of function in the arms, but retain some movement in the legs. Posterior cord syndrome: This type of injury occurs when there is damage to the back of the spinal cord. People with this diagnosis may experience impaired coordination. Brown-Sequard Syndrome: This type of injury occurs when there is damage to one side of the spinal cord. Those who live with Brown-Sequard Syndrome after a car crash may experience impaired movement, but maintain sensation on one side of the body while the other side of the body maintains movement but has impaired sensation. Cauda equina lesion: This type of injury occurs when the nerves between the first and second lumbar regions of the spine are hurt. Car accident victims with this type of injury may experience partial or complete loss of sensation. Complete paraplegia: People who suffer complete paraplegia have no sensory or nerve impulses below the point of injury, which must be at or below the T1 point (the first thoracic vertebra) on the spinal column. Normal hand and arm function is typically present; however, use of the legs and part of the trunk is typically fully impaired. Complete tetraplegia: These injuries occur in the neck or cervical area and result in paralysis of the arms, legs, and trunk. 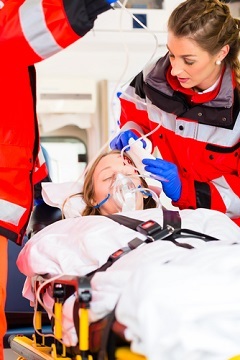 Ventilators may be necessary to keep the victim alive. Complete spinal cord injuries are currently irreversible. Broken bones: Broken bones may range from hips to arms, or from legs to collarbones. Any broken bone needs prompt medical treatment and may require surgery or other medical intervention. Burns: Serious burns can result from car crashes when fire is present. Burns are painful and expensive injuries to treat and they can have a lasting impact on an individual’s health. Amputations: Sometimes a limb such as a hand or foot or arm or leg cannot be saved and doctors must amputate after a car crash. This will forever change an individual’s life. Pregnancy complications: Both expectant mothers and unborn children are at risk of serious injury in a car crash. Death: A Wisconsin car accident can end someone’s life and leave a family grieving the untimely death of their loved one. If you suffer one or more of these injuries, then it is important to do everything that you can to protect your recovery. Please talk to your doctor today about any symptoms that you are experiencing so that a prompt diagnosis can be made and a treatment plan can be developed. Additionally, please contact our experienced Wisconsin car accident lawyers directly to discuss your specific injury and potential recovery.